In the latest issue of The Art Newspaper, the front page story is about international über-curator, Germano Celant, who is organising an exhibition for Milan’s Expo 2015 on the relationship between art and food. “Ho hum,” you think, but the truly startling fact is Celant’s fee of €750,000 (AUD$ 1,079,840). At 2-3 times the annual salary of any museum director in Australia, it’s a new benchmark for the curatorial profession. Because “curator” is a notoriously vague term, it makes one wonder exactly what duties are covered by Celant’s contract. According to his employers “his tasks include developing the visitor experience and selecting works from Italy and abroad” – which doesn’t sound too strenuous. Some of the money will be used to pay assistants. It suggests the Italians put a much higher price on art expertise than we do in Australia. It may also mean they are anxious to host a really spectacular show about food and art. For Italy, more than most countries, these are two of the most important things in life. In Harvest: Art, Film + Food, the Gallery of Modern Art in Brisbane (GOMA) is tackling the same topics as the Italians, but the two exhibitions are bound to be very different. With the Milan Expo and a big budget behind him, Celant will be able to draw on a huge range of works by famous artists. There will almost certainly be those relics of dinner parties glued to the table by Daniel Spoerri; references to Marinetti’s Futurist Cookbook; perhaps Arcimboldo’s faces composed of fruit and vegetables. GOMA is more constrained in its choices, as Harvest is essentially a show drawn from the permanent collection. As budgets keep contracting public galleries are having to fall back on their own holdings with ever greater frequency, striving to make something new from works that may already be familiar to the public. Curator, Ellie Buttrose – who can only fantasise about Germano Celant’s pay packet – has taken this responsibility seriously, perhaps too seriously. 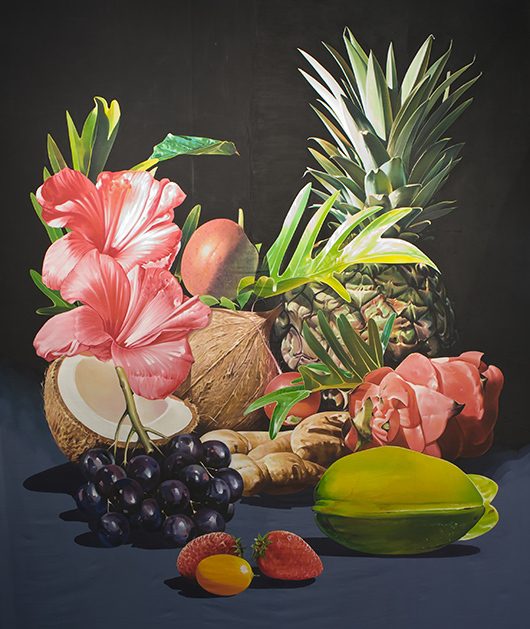 In striving to make a show about food and art that doesn’t devolve into a colourful collection of food-related works, Buttrose has divided the exhibition into two themes: ‘Objects in Circulation’ and ‘Land and Labour’, with a coda about ‘Imagining Another Future’. 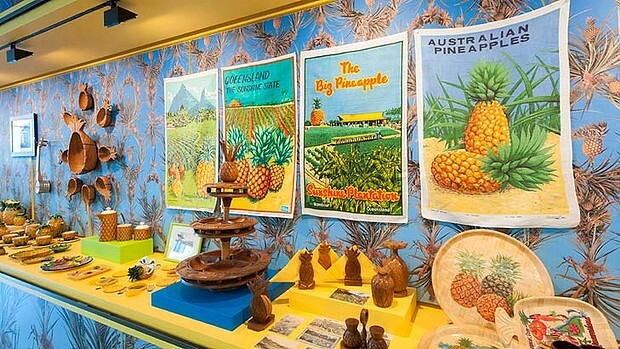 A pineapple-themed work from GOMA’s Harvest exhibition. This may sound vague and complicated, although it is no worse than most of the prose one finds in contemporary art catalogues. There is a legitimate intent here but the success of the show depends on the visual impact and legibility of the works. And this is the problem with Harvest. 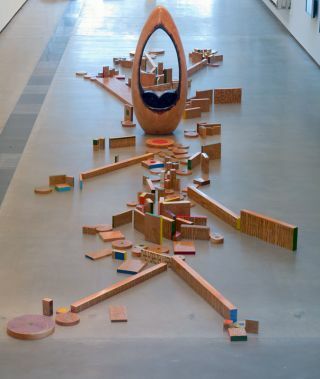 It may be intellectually stimulating and politically sound, but the choice and display of works is uninspiring. We enter this show with the expectation of enjoying artworks on the theme of food, but too many pieces make us stop and wonder how a particular item relates to the topic. 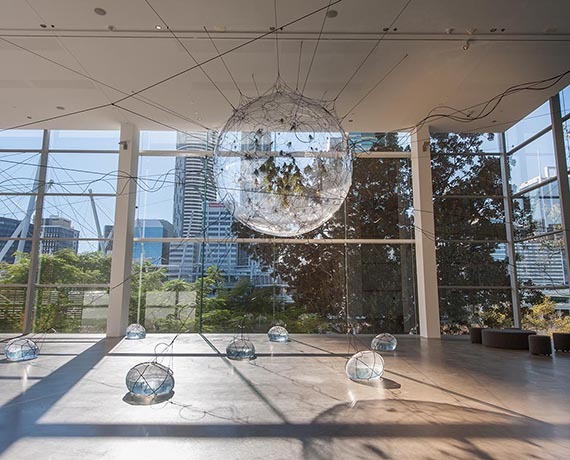 The centerpiece of the show comes from Argentinian artist, Tomás Saraceno, whose four Biospheres (2009) dominate the gallery’s wide central corridor. These plastic bubbles with bits of vegetation inside, are fanciful proposals for cloud cities – visions of a day when humanity takes to the skies and floats freely across national borders. It sounds a terrible pipe dream this week, as it’s obvious we’d first have to invent a world in which people don’t take shots at civilian aircraft. Even without this caveat, Saraceno’s works, which have been acquired for the collection with money from Tim Fairfax, are conceptual rather than sculptural. As objects, they look like they would be more at home in a science museum. The next most prominent installation is Emily Floyd’s Permaculture Crossed with Feminist Science Fiction (2008), which resembles a complex piece of IKEA furniture awaiting assemblage. The permaculture refers to the writings of biologist, Bill Mollison, while the feminist science fiction comes from Ursula Le Guin and Doris Lessing. These texts are plastered all over the components of the installation, but I didn’t see anyone stopping to read them. Whatever the cerebral pleasures of Floyd’s work, it doesn’t offer much in the way of spectacle. She brings together the discourses of science and science fiction, but in a way that will remain opaque to most viewers. One might also argue there is too much indigenous art in Harvest. The vast majority of Aboriginal works relate to the land, and often to specific animals and plants, but in this context the overall impression is far too generalised to sustain interest. Works such as Emily Kame Kngwarreye’s Yam Dreamings (1995) could be replaced by any number of similar pieces, by dozens of other artists, and the effect would be the same. A selection of still life paintings seems just as arbitrary. 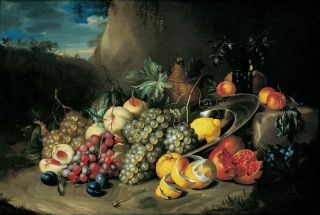 The oldest piece in the show is Alexander Coosemans’ Still life (1650) – a typical product of the Dutch Golden Age, with suggestions of both abundance and decay. It was a typical artistic strategy of giving with one hand and taking away with the other. Other conventional – and rather dull – still lifes are provided by artists such as Henry Short and Hans Heysen. There is a tonalist still life by Polly Hurry and modernist versions by Godfrey Miller and Jean Bellette. It’s hard to see what this selection is supposed to tell us, aside from the fact that artists have always enjoyed painting still lifes. To do justice to this genre the show might have included more examples, and perhaps better quality pieces. Still life is a fascinating subject, passed over here in almost indecent haste. I could go on nitpicking in relation to the many videos, posters and photographs in this show, which seem more concerned with social issues than with food. It’s not enough to simply say that food is a social issue: the art of curatorship requires specific arguments, not sweeping generalisations. You may recall that GOMA’s previous exhibition, Cai Guo-Qiang’s Falling Back to Earth, was a piece of consummate showmanship, with large-scale works made to dazzle the viewer. Harvest, on the other hand, is an exhibition in which the works are secondary to the ideas behind the project. If those ideas were clearly articulated by the items on display, there could be no argument. Instead, we only skate across the surface. I’ve focused on the art but Harvest is also divided into film and food components. The film program includes the predictable classics such as Babette’s Feast (1987) and Tampopo (1985), and a range of top class documentaries. The food is perhaps the most remarkable part of the whole enterprise, led by GOMA’s own master chef, Josue Lopez. 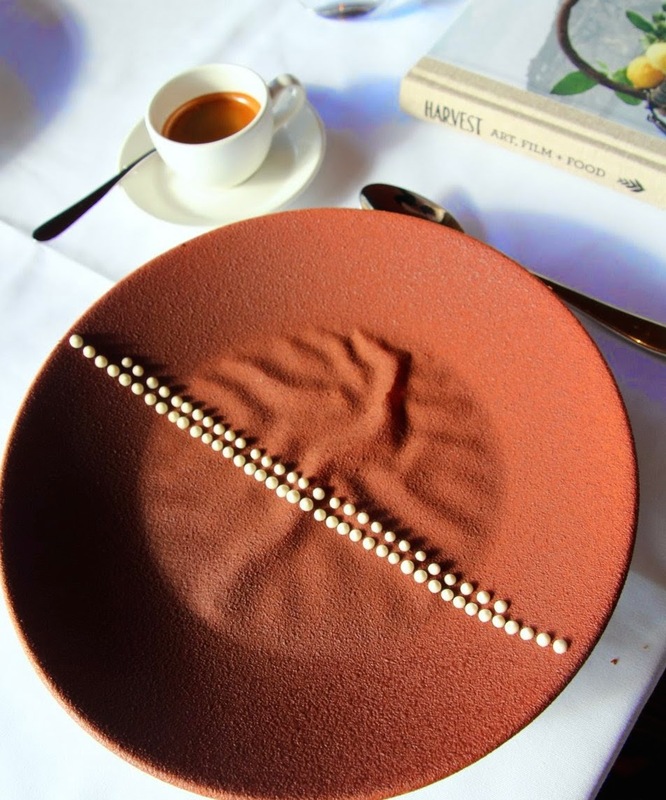 Ten chefs, including Lopez himself, have contributed recipes to the catalogue. Ryan Squires gives us a sophisticated recipe for ketchup, while René Redzepi tells us how to whip up a dish of crispy reindeer moss. GOMA Restaurant, Wattle custard, Daintree chocolate paint, Daintree vanilla curd. Pouring over these recipes, marvelling at the ingenuity involved, I began to realise why some people read cookbooks for fun. All the precision, subtlety and complexity that one misses in the selection of artworks is present in the dishes described by the ten chefs. It’s the most innovative part of an ambitious banquet of art and food in which there is plenty to enjoy, even if the main course is slightly underdone.